Your tires are an important component of your vehicle, making it vital that you have a tire repair service shop you can rely upon. But do you really understand what it is that your tires and wheels do? Yes, they serve as the point of contact between your vehicle and the road, but they are also what propels your vehicle down it. Your engine supplies the power, yet how much is needed depends upon the resistive force generated between your tire and the road surface as well as the weight of your vehicle. To drive, your engine must produce enough power to overcome this friction. That power is manifested in the rotational force of your wheels, which then uses the tires to apply it to the road surface. 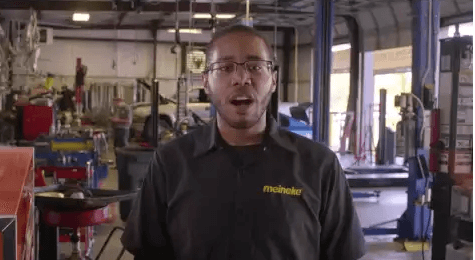 To learn more about how tires work, visit Meineke #1134 in Rock Hill, SC. You know that you need your tires in good working order to drive your vehicle. So, perhaps a better question than why your tires are important is why you should maintain them before you're forced into frantically searching for "flat tire repair near me." The average car weighs over 4,000 pounds, which is a lot of weight sitting on your tires. Differences in inflation between tires causes your vehicle's weight to be distributed unevenly. Over time, that uneven weight distribution can lead to issues with your vehicle's balance, which then affects its safety and performance. Thus, following a routine rotation service is vital. You'll find such a service here at Meineke #1134 in Rock Hill, SC. "My tires seem a bit worn down, should I find a flat tire repair shop near me?" This is a frequently asked question, but there is no universal answer. However, there are easily observable signs that your tires may need to be replaced or repaired. For example, if your tire pressure reading is consistently low, even after replacement or inflation, you may want to consider tire pressure sensor replacement. Loss of tread, poor vehicle handling, and visible punctures are also common signs of wear and tear. Stop by Rock Hill SC Meineke #1134 to speak with a tire repair professional. A flat tire leaves you stranded, pure and simple. Yet there are other reasons why you should ask yourself "Is there a good option for tire repair near me?" long before you ever get a flat. Avoiding routine tire rotations won't necessarily keep your vehicle from driving (up until excessive wear causes a flat, that is), yet it does limit their performance lifetime. Given the significant financial investment your tires represent, wouldn't you want to get the most out of them? 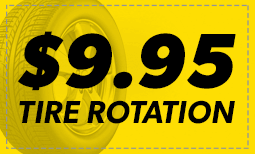 Contact us at Meineke #1134 in Rock Hill, SC to learn how a low tire rotation can save you hundreds of dollars in the long run. Many of our customers ask themselves, "When should I visit a tire repair shop near me?" The answer depends on the age and current condition of your tires, your personal driving habits, and the condition of your local roadways. Individuals who drive on poorly paved and broken roadways will have to replace their tires earlier than most drivers. If you drive long distances at relatively high speeds, you may need to have your tires inspected once or twice yearly. If your tires are over ten-years-old, it is definitely time to consider a replacement. Get in touch with our Rock Hill, SC, Meineke #1134 store if you have specific questions. If you're in need of new tires, you probably have concerns about the actual cost of tire replacement. While worn tires increase your risk of performance and stability issues on the road, that doesn't make affording new tires any easier. Fortunately, we at Meineke in Rock Hill, SC can. Once you have your new tires, be sure to make frequent visit to our Meineke #1134 web page. We frequently post repair and tire rotation coupons there. This is our way of rewarding the trust you place in us.